Price - Rs 256 /- for paperback , Rs500 for hardcover . About The Author - This book has been written by K.Vijay Kumar, former I.P.S. Officer and Chief of the S.T.F. (Special Task Force ) that finally slayed the infamous and dreaded bandit in an encounter during operation "Cocoon " in 2004. What I liked about " Veerappan : Chasing The Brigand "
This is a true life account of the life and death of the dreaded Sandalwood and Ivory smuggler and Bandit - Koose Muniswamy Veerappan.It gives an interesting and detailed account of his life from his birth in 1962 to his nail biting encounter and death in 2004 . The writing style is lucid and easy to comprehend and makes for an interesting read . It has quite a few instances of humour which lightens the mood . It is fast paced and full of thrills and makes you want to turn the pages . The book is a revelation and sheds a lot of light about the various facets (some true some hype ) of Veerappan the boy,Veerappan the Robin Hood ,Veerappan the Father ,Veerappan the medicine man to Veerappan the smuggler and the Ruthless foe and killer . What I did not like about " Veerappan : Chasing The Brigand "
I only felt some loopholes in the "true account " that any logical person would feel too .The book has a political bias with some politicians like late Jayalalitha glorified and some delegated to the back seats as if it was a one person political effort throughout the 20 year hunt for the Bandit . Lot of space has been given to the author and his training which I found unnecessary since the book was about the Bandit and not the Officer. I would have preferred more about the Fugitive . 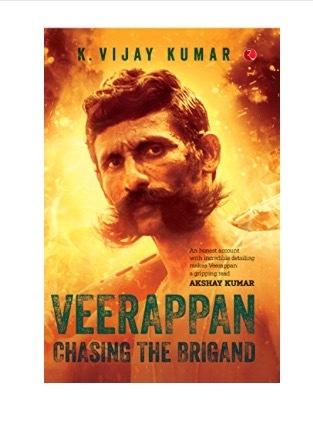 It seems that Veerappan was able to have an easy reign because of his political bosses and finally met his end when he became too ambitious or useless for them as no effort was made to capture him alive or give him a fair trial but all that I think is beyond the scope of a book review . This book is a fast paced, true life thriller - a must read for anyone intrigued by the handlebar moustached Bandit Veerappan or anyone who loves a good thriller . When Veerappan was in news, I used to browse a lot & always wanted to read more n more.. Had so much mixed views for him! Shall for sure read this book in sometime! It's a small book and quite a thriller ! I am not surprised that Jayalalita is shown in all bright light, every one down south is crazy for her still. I haven't read this book though. I think more so after her death . Book is better or the movies made on him? The book is quite good and the closest to the reality , unfortunately I have not watched any movies by that name . Good, I always wanted to know about this book. Good insights,Thanks !